Abreu alleged Abdelaziz represents “corruption” and “special interest.” He made the allegation by tying Abdelaziz to disgraced mayor Jose “Joey” Torres. “Where did the $12,000 Joey Torres gave you in your last election come from?” asked Abreu (pictured, left) in his first question. He suggested Torres gave Abdelaziz dirty money in 2016. Torres spent $12,000 and tried hard to unseat then-councilman Andre Sayegh, an inveterate foe. Abdelaziz said his donations are reported on campaign finance reports. “I never missed a report. I’m open and transparent. There is no corruption. I have nothing to hide. I don’t represent special interest. I represent the residents of the 6th Ward,” said Abdelaziz. Abdelaziz claimed Abreu has been late in disclosing his donors. Abreu had just $450 in his campaign account, according to his 29-day pre-election report. Abdelaziz raised $23,575 for the race, according to his report. Both men submitted their 29-day reports on time. Abreu slammed Abdelaziz for supporting Torres’ recreation tax in 2015. He also attacked him for voting in favor of the tax levy in July. Abdelaziz said he did the “responsible” thing when he voted in favor of the tax levy. Abdelaziz explained once the introduced budget is presented to the City Council that’s when the tax increase is discussed. While asking his third question, Abreu alleged Abdelaziz had been arrested as a teenager by citing an old Paterson Times story. Abdelaziz denied the allegations two years ago. He denied them again at the debate. “These false gossips, Paterson politics gossip, you are talking about, are simply false,” said Abdelaziz. Abdelaziz had to undergo numerous background checks over the years. For example, he had to undergo background screening when he was hired at Passaic City school district and when he was sworn in as a councilman. Abreu continued to attack Abdelaziz in his closing remarks. “I’m running not for no special interest. Not to favor anybody. And not to be a yes boy,” said Abreu, 36, towards the end of the 40-minute debate. He twice said he won’t be a “yes boy,” referring to Abdelaziz’s alignment with the mayor. “I don’t have political friends behind my back telling me what to say,” said Abreu. Sayegh backed Abdelaziz, 30, for the 6th Ward seat, but hasn’t publicly endorsed him for the November race. Abreu is backed by former councilman Alex Mendez, who came in second place behind Sayegh in the mayoral race. 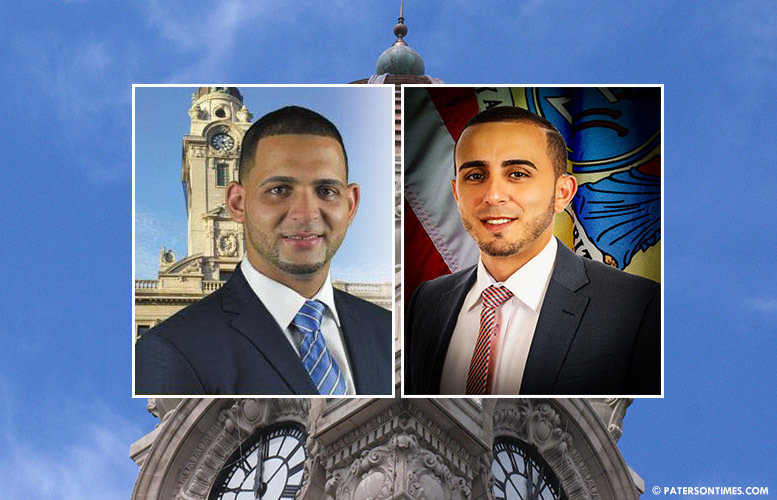 Both Abreu and Abdelaziz were working for opposing candidates in the mayoral race. Abreu mimicked Mendez’s populist style at the debate. Abreu, who is relatively unknown even among key leaders of the Dominican community, said everyone knows him. Abdelaziz appeared restrained at the debate. He was far more aggressive when he debated Sayegh two years ago. “I believe in solutions, my opponent believes in slandering,” said Abdelaziz. He urged voters to focus on issues and ignore the attacks. He cited his role in increasing police presence in the 6th Ward. Abdelaziz proposed the police substation at the South Paterson Library when he ran against Sayegh. The substation was opened in June.